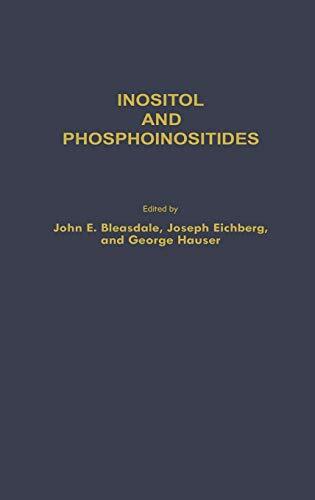 Inositol And Phosphoinositides Metabolism And Requlation: 9780896030749 Hardcover - LIMEROCK BOOKS INC. The Chilton Conference on Inositol and Phosphoinositides, held on January 9-11, 1984 at Southwestern Medical School, University of Texas Health Science Center, Dallas, Texas, was the third in a series of conferences on cyclitols and phosphoinositides. The first took place in 1968 in New York [Ann. New York Acad. Sci. (1969), 765,508-819] and the second was held in 1977 in East Lansing, Michigan [eyclitols and Phosphoinositides, Wells, W. W. and Eisenberg, F. , eds. , (1978) Academic press, New York, pp. 1-607. ] In the interim since the previous conference, not only has the pace of research in the field accelerated markedly, but the physiological importance of phosphoinositide metabolism has become apparent to an increasing number of investigators from diverse fields in the life sciences. Thus it seemed to us timely for both recent and established workers in this area, as well as others whose interests impinged on it, to meet in order to disseminate new information, to review, and perhaps arrive at, a consensus of our current understanding of the role of inositol and phosphoinositides, and to establish new directions for research for the next few years. The expansion of the field since the last meeting made it mandatory to restrict the scope of the topics covered at the conference, primarily to aspects dealing with mammalian systems. We sincerely regretted the exclusion of recent research on cyclitols and phosphoinositides in microbes and plants and hope that these areas will be included in future conferences.